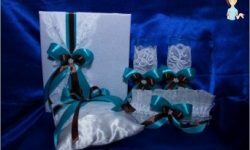 Recently, more often for decorativeDecoration of gifts, interior items, clothes and accessories are used artificial flowers made of hand-woven fabric. Most often silk is used for these purposes, it looks expensive and exquisite, however, fabric flowers can be made from other materials - satin, textiles, leather, drape, etc. Making beautiful and elegant flowers from silkWith their own hands it is very interesting, fascinating, fascinating and at the same time laborious process. Each stage of this handmade work, which is sure to please those who like to spend their free time making various crafts, is interesting in its own way. Selection of fabrics and accessories, purchaseDecorations of stones, feathers and beads, dyeing fabrics, processing leaves and petals and the subsequent design of the finished product is so tight that there is no strength to break away from work for a minute! I want to create my own masterpiece as soon as possible. In this case, it does not matter what you do - a small brooch, a three-dimensional ornament on a dress or a hairdo, a buttonhole or a corsage on your hand, the most important thing is to do everything with a soul. 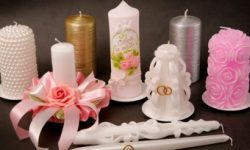 The most popular material for manufacturingFlowers and other beautiful, useful ornaments is silk, and this despite the availability on sale of a huge number of cheaper synthetic and semi-synthetic materials with similar properties. It's all about attracting admiring looksSurrounding the pleasant shine of natural silk, which is preserved for many years. Flowers from silk, everyone can learn the art of making, always look beautiful and very natural. Moreover, this very delicate, soft to the touch andAlmost airy material is the most malleable and comfortable in work, unlike satin and organza. Therefore, experienced masters in making such jewelry give their preference to silk. But to beginner needlewomen who passTraining and only master the technique of fabricating flowers from tissue with their own hands, it is recommended to start work with inexpensive synthetic fabrics. Well suited to the role of "Training cloth"Such materials as artificial silk and viscose. After the hand is "Stuffed", The basics of floristics are mastered, and all operations will be performed accurately and accurately, you can proceed to use the beautiful and expensive Japanese silk for flowers. Crafts made of natural silk are poured,Play with different colors and amazingly sparkle both in the rays of the bright sun, and with good artificial illumination. In addition to the presence of external attractiveness, this material can boast such properties as high hygroscopicity. It dries very quickly after getting wet,While retaining the shape given after the twisting of the petals. 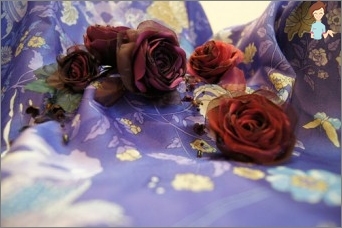 Flowers made of silk, made with their own hands, will be the most pleasant and memorable gift for any girl and woman, they will perfectly decorate any interior and "Revitalize"Old clothes. Often for making silk flowersJapanese technique is used kanzashi. Flowers made in this technique can often be seen as beautiful and refined decorative elements adorning lambrequins, curtains and curtains. 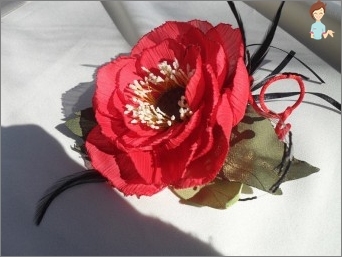 Japanese kanzashi technique assumesMaking 2 types of petals - sharp and rounded, which are added in a special way. It's very easy to do them, for this you just need to find some free time. This technique involves the use of silk ribbons of different widths as a material for the petals. If you are interested in such an excitingOccupation, as the production of beautiful flowers with their own hands, you must first acquire all the necessary devices. It is not necessary to purchase any special tools that can be found in any store selling hand made products, because they are not always cheap. 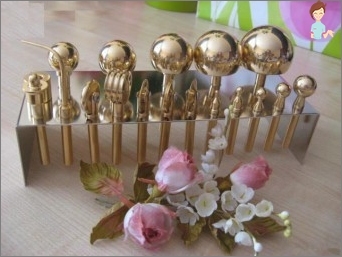 You can quite successfully and accurately make a flower from silk as with these special devices, and using the usual tools that are found in the "Repair case"Of any man. In addition to the above items, you will need a saucepan, 200 ml of water and 3 teaspoons of gelatin. First, you need to prepare a solution forProcessing of silk. In a saucepan, you need to put 200 ml of water, add gelatin in the amount of three teaspoons, mix well and let it brew for about twenty minutes. After that, the mixture should be heated on the plate until the gelatin is completely dissolved. When the solution becomes homogeneous, it must be omitted inJapanese silk for 3-5 minutes. The fabric must be soaked with a solution, only after that it can be removed. In this case, it is strictly forbidden to press it. The fabric must be weighed to dry verySmoothly, without wrinkles, to get the perfect canvas for the formation of petals and leaves of the future bud. If the purchased fabric or trimmings found in your home are wrinkled during storage or transportation, they must first be ironed from the wrong side. After the fabric has completely dried, you canProceed to form a flower. 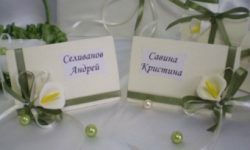 It is necessary to cut out the necessary number of petals and leaves of their gelatin-impregnated silk according to the prepared cardboard templates. Specialists recommend placing the blanks at an angle of 45 degrees to the so-called share thread. After this, it is necessary to gently scorch the edgesAll the petals, you can do it with a candle. After this, with the help of brass boules, give them the necessary bend. When all the elements are ready you can start assembling the flower, you can do it with a needle and thread, as well as an adhesive gun. Flowers made with their own hands will be the best gift for everyone who loves everything bright and unique.